Founder of far-right French political party to face trial again for hurling Holocaust insult at Jewish singer. 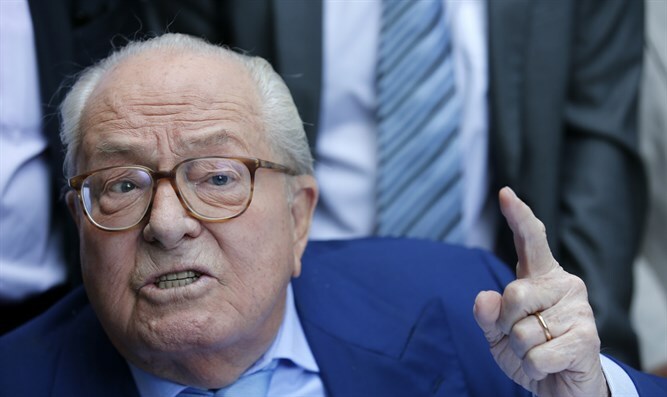 Le Pen, 89, has a long history of lashing out at minorities. He already has several convictions for inciting racial hatred and Holocaust denial. He made the remark about pop singer Patrick Bruel in a video interview posted on the FN's website in 2014. Asked about criticism from Bruel and other singers, he chuckled and said: "Listen, we will make an oven load next time". The remark was widely seen as a veiled reference to the crematoria used by the Nazis to incinerate Holocaust victims. His daughter, current party leader Marine Le Pen, slammed it as a "political mistake". The elder Le Pen, who delights in provoking, denied his remark was intended as an allusion to the Nazi death camps. A member of the European Parliament, he was charged in February after the EU assembly lifted his immunity from prosecution. In 2015, the former paratrooper was booted out of the FN by his daughter for repeating his view that the Holocaust was but "a detail" of World War II. He remains the FN's honorary president, however. Since taking over the leadership in 2011 Marine Le Pen has worked to purge the FN of anti-Semitism and overt racism bequeathed by her father while continuing to drive a hard line on immigration and Islam. However, she has continued to advocate for positions which would discriminate against the Jewish community, such as banning skullcaps along with other religious head-coverings. In May's presidential election voters disavowed her nationalist agenda, placing her a distant second behind pro-EU centrist Emmanuel Macron. In June parliamentary elections the FN also fell far short of its goal, winning only eight seats in the 577-member National Assembly.